The Dockyard Port of Plymouth is under the statutory control of the Queen’s Harbour Master (QHM), Plymouth. The majority of the traffic in the port is either military or military support; the port serves the biggest Naval Base in Western Europe, with base ported vessels including nuclear submarines and large warships, and a large number of visiting ships receiving Operational Sea Training. On the commercial side Brittany Ferries conduct 500 or so movements a year to and from ABP Millbay, while the commercial wharves in the Cattewater see Devon and Cornwall’s fuel, as well as many other cargoes, being moved. There is a healthy commercial commuter and tour craft trade, while the recreational sector is lively, with 5 marinas, many water access points and clubs. Activity ranges from high profile and risk events such as offshore powerboat Grand Prix, through international sailing championships and local races to individual sailors, rowers, canoeists, divers, surfers and swimmers. 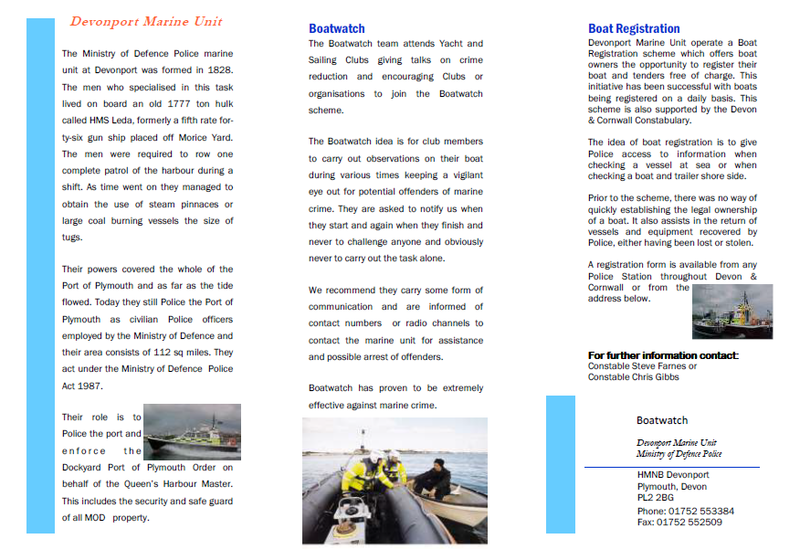 The Ministry of Defence Marine Police operate a Boat Watch scheme at Plymouth; the idea is for club members to carry out observations on their boat during various times keeping a vigilant eye out for potential offenders of marine crime. They are asked to notify the MDP Marine Unit when they start and again when they finish and never to challenge anyone and obviously never to carry out the task alone. We recommend they carry some form of communication and are informed of contact numbers or radio channels to contact the marine unit for assistance and possible arrest of offenders. Boat Watch has proven to be extremely effective against marine crime. 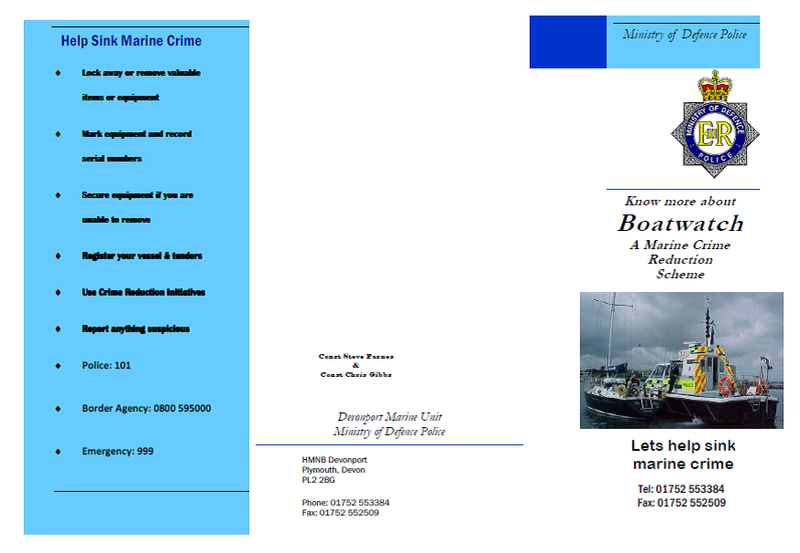 This entry was posted in Home Front and tagged Boat Watch, Marine Crime Prevention, MDP Marine Section, Mod Police, Plymouth, QHM by homefront4u. Bookmark the permalink.